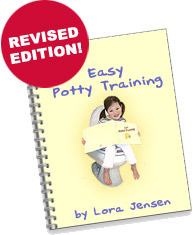 Children's achievements build on their successes and potty training is no exception. If you want your child to succeed in staying dry and clean, you'll have to help him dress the part. That means that before you begin toilet training, you need to assess his clothes for easy and quick potty access. If his clothes don't fit the bill, it may be the right time to invest in some clothing that is suited to this milestone task. Hilary Charles* of Albany, New York, finds that the fancy designer clothes her mother in-law buys her child often have unusual closures, or special laundering instructions. "She buys beautiful clothes for my son, but they just aren't very well suited to potty training. I had to tread carefully to explain to my mother in-law why my son was wearing simple, wash and wear items instead of the stuff she buys him in fine baby boutiques. You'd think that as someone who has potty trained a child, she'd understand my predicament, but no such luck." Sandy Milhouse* of Cuyahoga, Ohio, a mother of 4 children, has loads of experience in potty training dress. "With my first, we had a wonderful daycare provider, who excelled in training the kids as a group. Her prerequisite was to wait until the weather had warmed up and to keep the kids in underpants and tops, only. The kids had only to pull up and down the underpants. Once they mastered that art, they could graduate to wearing little shorts or skirts with elastic waistbands." Tara Washington* of Pittsburgh, Pennsylvania, and a daycare provider has this to say about dressing for potty training, "When I first started out as a daycare provider, I assumed that parents understood that they had to dress the kids differently for potty training. That set me up to feel some resentment toward the parents. Some of them really didn't think about this aspect of potty training. Once I realized that, I learned to prepare the parents. I like to call a meeting to discuss training and appropriate clothing is definitely on the agenda of topics I like to address. I also found that some parents were upset with me for sending home wet or soiled laundry at the end of the day, but we don't have laundry facilities. Anyway, doing laundry is just not part of the job. I learned to tell parents to expect to be sent home laundry--lots of it. Just letting the parents know what to expect prevents a lot of resentment and misunderstanding."